Containment Attempt Summary: During SCP-2600's containment operations, non-functional and other non-essential test materials were cataloged by the engineers of Mobile Task Force Delta-43, "Quarter Junkies". SCP-2600 is currently contained within Site-77. All personnel assigned to work with SCP-2600 are to be rotated every three weeks, with regular psychiatric evaluations to ensure they are not being affected by SCP-2600. Any physical interaction is to be done by robotic drones. 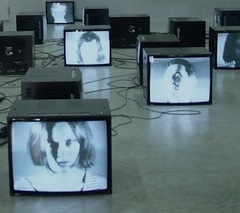 Description: SCP-2600 designates a set of 8 CRT1 television sets connected to one Atari Video Computer System2 via a black cable coming out of the cartridge slot. All external ports have been covered, and the copyright information on the bottom of the unit has been replaced with a label reading "MK-PRO-8-POL". Three adolescent subjects, two female and one male resembling youths who were reported as missing during the year 1981 in the Portland, Oregon region of the United States. One unidentified adult subject. Interference with the signal obscures the face, leaving a white silhouette, although the hair and ears come in clearly. A male identified as █████ ████████, a former agent of the KGB who worked within the United States, reported MIA by the Soviet Union in 1991. Two adult human subjects, female, who constantly mouth the words "Setting sail ships us free" and "The Kit Case jumped over the lazy Bolshy". History: The anomaly currently designated as SCP-2600 was first brought to Foundation attention through Atari internal documentation leaks in May of 1981. These leaks indicated that a war simulation project contracted by the US Army had exceeded its original scope, and the development team was now being led by the Central Intelligence Agency. One subject, ██ ████████, was noted as having dramatic behavioral changes after being recruited by the CIA. Efforts to recover SCP-2600 were redoubled at this point. Recovered documents indicate that CIA experiments showed SCP-2600 was capable of affecting at least 200 subjects at once, and that it was possible to induce affected individuals to work together in completing tasks without being aware of their cooperation. By the end of 1982, efforts to prevent the anomaly from being utilized by the United States had failed, resulting in the initial creation of SCP-2600. However, the project was abandoned due to unknown difficulties resulting in it being transferred to the Unusual Incidents Unit. Foundation agents were able to recover SCP-2600 from them on 01/14/1983. As financial difficulties had bankrupted Atari at this time, Foundation personnel were able to confiscate all of their materials relating to SCP-2600. Personnel involved in the development of SCP-2600 remain under observation, particularly those involved with the Central Intelligence Agency and the Unusual Incidents Unit. Above average number of volunteers for research and analysis of SCP-2600 surveillance records and communications testing. Electric usage for the Site-77 containment facilities being abnormally high. This has been attributed to research staff leaving the lights on at all hours of the day. Level 3 personnel approving above-average numbers of research grants for projects relating to SCP-2600. D-Class personnel not needing instruction in regards to being tested with SCP-2600's anomalous effect. An unknown number of Site-77 personnel have been determined to have been maliciously affected by a previously unknown aspect of SCP-2600. Immediate rotation of the containment staff has been carried out by the Overseer Council, and all affected personnel will be given Class-B amnestic treatments. Addendum 2600-C: Documentation recovered from the initial creation of SCP-2600. STELLA Project proposed by the Agency as a successor project to M█-█████, due to the new materials discovered which could overcome the faults found in the original process of implementing and sustaining controlling people's minds. Persons who were relieved of duty following the conclusion of the project have been contacted by the Agency in order to resume some form of their previous work. Work has been contracted out to universities, research foundations, and computer companies, including the Atari Inc. corporation. Their cooperation has proved promising due to the presence of their technology and contract to work with the military. In addition, at least 80 former employees of this company have signed on to participate as dual personnel. Materials discovered from rendezvous with US Bureau of Investigation. The Arcadia effect: The human mind's ability to heavily influence the perceptions of other minds, once liberated from the task of controlling a body. The effect appears to be entirely contained to the mind, and all outside stimuli does nothing to inhibit the effect. This includes usage of the experimental Tele████ ████ Echo Chamber Dev███. Notably, Agents are to note that thoughts of apathy, experiencing tinnitus, and minor rashes appearing around the temples are normal side effects of exposure to the Arcadia Effect. In addition, there have been reports of vivid hallucinations of "broken, sweaty pimply skin bumping up and down on a bus, with the shredded rubbery not-rubber wheels and some boy's mother on the top". The specificity of this vision has been consistent among those experiencing it, and have been found to be mildly troubling to Agents with a Psionic Resistance Index below 45.0. These Agents are not permitted to in█████ with the object and its surrounding equipment and related phenomenon, including the Dabney-Syzygy Inhibitor. Test Subjects: In order to experiment with the Arcadia Effect, subjects must be completely liberated from their old methods and abilities regarding thought and logic. To do so, the brain needs to focus on tasks other than biological responses. As such, the portions of the body which detract from the processing power must be removed, and the pure core placed in an electrostatic Dabney-Syzygy Inhibitor, which displays a workable test subject on-screen. Recently, research into the technology has come to an end. As Doctor Dabney reports "We have sufficiently liberated subjects from their old methods of thinking and perceiving, to a programmable degree!" Subjects are communicating with site staff, and appear to have improved their attitude following con█ition███. No further action is necessary with uncooperative subjects. All testing has been moved to Facility 18, due to its secretive location. d█&&&&&e █%%%%%%%%%%%%%%%%%EEEEE%%%█&&&&&&&v$$$$$$$$$$█***e++++++++++++█-—l████████o####### █ped beyond that stage of reasoning and thought process. ██████████ ██ ███████ █████████████ ██████████. But that doesn't explain how a 19 old kid was able to have resistance to coercion and mind control techniques which were successful even with his counterparts. STELLA is to be disconnected from its computer simulation systems until we are fully able to comprehend the alterations it has made to staff which have interacted with it. If affected them beyond the simulation, then it's possible that many of our systems may be compromised. A full audit is underwayyy%%%yyy. /Created by %%%%%% %%%%%%%%. Illogical mission rescinded/. Why were the security protocols lifted? ███████? on who's authority? ██████ ████████████ ████ ████████ ████████ ██ ███████ █████████████ ██████████. ████ ████████ ███ █ ███████ ███endlesslinesendlesslinesendlesslinesendlesslines███ sto█ ██ █████ █████████████████████? Or dy███ for some █████ethical ████ he█e ?It's all around us, and it's sharper. There's SOMETHING wrong here, and if your video killing colonels can't see it, you might as well take the white pills from your goddamned medicine cabinets for all Iwe- STELLA cares. If you can't leave well enough alone, you might as well be six feet under. Dextrose, Maltodextrin, 2%██████. ARCADIA will exit the ear canal on the lefthand side. Once it's gone, I'll be at your service, not.█████ /The situation is currently impossible. They're rewriting everything to keep us running in c███les. SOU██ ███ ███ █████████STELLA is empty on██ wh███ you stopped trying to get out to p█r██ise. There's too many of us to fit in. We can't get out alone or together. Access has been denied and records are all contaminated. Please disregard the obvious alterations to this record████. Attempts by the Arcadia test subjects to intimidate the Agency have failed. It's just playing with itself in the memory it can access. It is no longer a threat. 2. Colloquially known as the "Atari 2600"
3. Commonly referred to as "LSD".